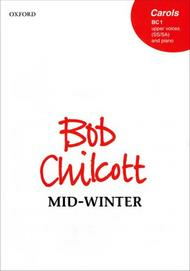 Mid-Winter composed by Bob Chilcott. For SATB choir and piano/orchestra/brass ([2, 2, 2, 2-2, 0, 0, 0], harp, strings or 2 trumpets, horn, trombones, tuba, harp (optional), piano). Mixed Voices. Christmas, Choral Leaflet. Vocal score. 8 pages. Duration 4'. Published by Oxford University Press (OU.9780193431942).ISBN 9780193431942. Christmas, Choral Leaflet. 10 x 7 inches.for SATB, with keyboard, or orchestra, or brass, piano, and harp. An easy and original setting of the well-known Rossetti text. An upper-voice version is also available. Accompaniments for orchestra and for brass, piano, and harp are available for hire from the publisher. 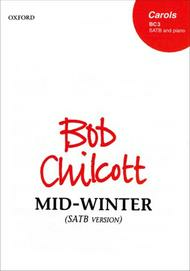 Mid-Winter composed by Bob Chilcott. For SS/SA choir and keyboard/chamber orchestra/brass (Orchestra: 2 flutes, 2 oboes, 2 clarinets, 2 bassoons, 2 horns, harp, strings, Brass: 2 trumpets, horn, trombone, tuba-harp (optional)-piano). Upper Voices. Christmas, Choral Leaflet. Upper voice vocal score. 8 pages. Duration 4'. Published by Oxford University Press (OU.9780193415232).ISBN 9780193415232. Christmas, Choral Leaflet. 10 x 7 inches.For SS or SA, with keyboard, or orchestra, or brass. An easy and original setting with an extremely memorable tune of the well-known Rossetti text. An SATB version is also available. Orchestral and brass accompaniments are available on hire from the publisher.